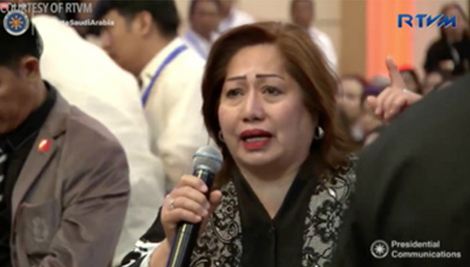 Philippine President Rodrigo Duterte opened the floor for overseas Filipino workers (OFWs) in Riyadh for questions during his meeting with the Filipino community. "What else is there to say to you? If you want some questions answered, I am ready. You can take the floor. Let's have a short time for an open forum." Duterte in his speech. In front of Duterte, OFWs raised problems ranging from the lack of a department for migrant workers and the need for wage increases. Another woman took the mic just to say, "Hello, Tatay (Dad). I have no questions at all. I just want to say thank you that you have given us hope. Thank you so much." In a firm voice, a woman faced Duterte first: "My first question is, where is the Department of OFWs? That is the first question – the Department of OFWs. We want it." Duterte said the Department of OFWs "is coming." In response to a similar question later during the forum, Duterte said, "The creation of a department does not belong to me. It belongs to Congress." On another issue, a man pushed for a national ID system just like in Saudi Arabia. Duterte replied, "It's also pending in Congress. I'm only 9 months into the presidency. We're working on it, actually, because it's good." Another woman said OFWs in Saudi Arabia have long been waiting to have an ambassador. "I would like to take this opportunity to endorse Madame Imelda Panolong because she has the huge knowledge for being an ambassador." Panolong is the charge d'affaires or officer in charge of the Philippine embassy in Riyadh. In a mix of English and Filipino, the man said, "My only question, Mr President, is, don't we have rights, being OFWs, to represent public office in the government like to serve the Filipinos overseas and to gain the ambassadorship for the first time in Saudi Arabia?" The most emotional plea came from a woman whose voice cracked as she addressed the President. The woman appealed for a hospital for stranded OFWs, and also for lawyers who can help migrant workers like them. "Marami pong bulag. Kailangang buksan natin ang ating isipan," she said. "Mahal na Pangulo," she said, "una sa lahat nagpapasalamat ako sa Panginoon. Kristiyano't Muslim kami, ibinigay ka ng Panginoon sa amin." "Wala pong presidenteng talagang nakatulong nang malaki, kundi kayo po." Duterte was the first Philippine president to visit Saudi Arabia since Gloria Macapagal Arroyo did in 2009. The other Philippine president to have visited Saudi Arabia, aside from Duterte and Arroyo, was the late Ferdinand Marcos.